To the good fortune of art lovers of Islamabad, Gallery Louvre is continually introducing innovative artwork from different regions of the country. The latest inductions are from two major cosmopolitan cities of Pakistan, Karachi and Lahore. The art exhibition titled “Bahtay Rang” features effervescent canvases of Khusro Sabzwari and Ali Karimi. Sabzwari, a veteran artist from Karachi, has explored creativity in his paintings, using vibrant tones and simple subjects. While Ali Karimi, a young up-and-coming artist who develops figures by using a single colour in oils, hails from Lahore. “The works of both artists have been combined in a group show as they have certain similarities in their techniques of paintings that is using extremely diluted colours but are poles apart when it comes to their art on finished painting” said Saleem Lalani, curator of Gallery, while appraising the artworks. 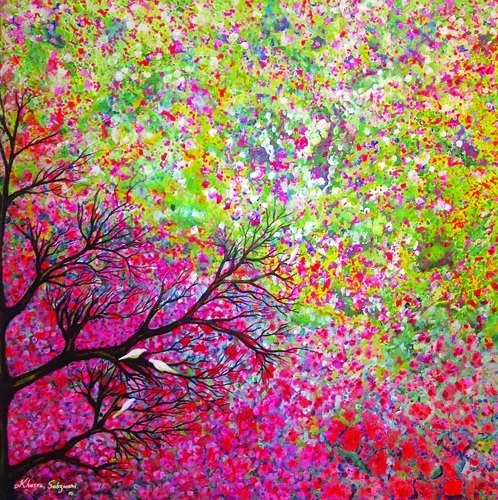 The multi-hued feathers of the enchanting peacock, the vibrancy of colourful flowers, and beautiful birds in Sabzwari’s artworks disclose the fact that the artist derives his inspiration from the beauty of nature. Artworks titled ‘Fascination’, ‘Shadows Enlighten’, ‘Serene Reflections’, and ‘Cheery Blossom’ reflect the message of the artist that humans should take collaborative measures to protect the environment. Vibrant colours and fascinating abstract in Sabzwari’s canvases are not merely stunning decorative art pieces, but the artist through his work has highlighted the affects of global warming and pollution while demonstrating the need for immediate measures to counter climate change. The artist is an engineer by profession but an artist at heart. “The extraordinary gift of clairvoyance runs in my blood”, said Sabzwari, whose paintings depict the reality of his dreams. “When I throw colours on my canvas, shapes emerge in my mind and I manoeuvre my brush so that the colours can assume beautiful forms and shapes” reflected the artist, with more than 3 decades of experience. 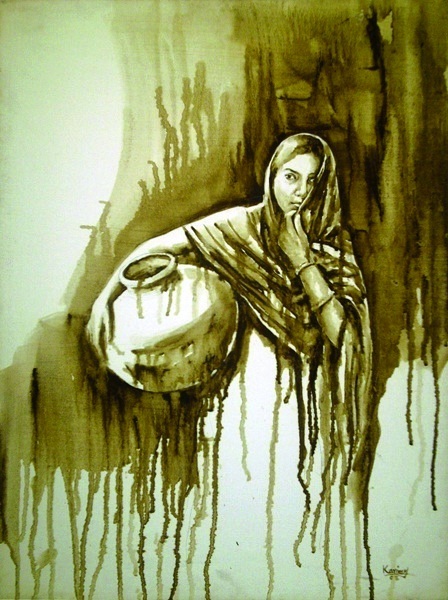 Ali Karimi, an artist from National Collage of Arts Lahore has adopted a unique style of painting by using wash paints of oil medium. He dilutes a single oil colour to almost a consistency of water and then uses the tricky medium, to develop figures, faces and expressions through the drops of colours. “I use a lone colour because scientifically our memories and our dreams are of single colours; the colours we see in them are the colours we want to see. I want to give that freedom to people who appreciate my paintings, they can fill them with any imaginary colour they want to” said the artist elaborating his work.